The e Cigarette Passthru Battery using the Kanger AeroTank Airflow clearomizer is the best of the best. It gives you a high quality vaping experience and the capability to adjust voltage and airflow; and vape while you charge your battery. The Kanger AeroTank is a top notch clearomizer by Kanger that offers clouds of vapor and a customized vaping experience. Not only is the Aerotank made of Pyrex glass and food grade stainless steel, it has dual coils that are a cinch to replace. Also, it has an airflow base that allows you to adjust how much vapor you receive. 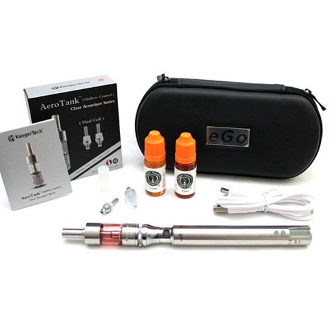 The variable voltage passthru is a state of the art eGo battery with all the bells and whistles. A lock-in feature to lock your favorite voltage into place, an LCD read-out screen to allow you to keep track of battery charge and voltage and a passthru feature that gives you the capability to vape while charging your battery. NOTES:The metal tube in the center of the AeroTank runs strait through the clearomizer, so avoid getting liquid into the tube, otherwise leaking may occur. A small amount of liquid can leak from the mouthpiece when you're changing the coil (wicks) or adding liquid, since the seal is temporarily broken when the base is removed. Gurgling or leaks usually happen when liquid ends up in the metal tube in the middle. To resolve this issue without emptying the tank, remove the clearomizer from the battery and blow through the mouthpiece. We recommend wrapping a tissue or paper towel around the end to catch any liquid. If possible, keep the tank more than 1/3 full. This helps maintain the vacuum and will help prevent leaks. The coils (wicks) have a life, on average of 10-20 days depending on the volume of vaping. When they burn out, they may cause a bit of leaking or lack of vapor. This can be remedied by simply replacing the coil. The coil (wicks) can loosen when unscrewing the tank or the base. Always check the coil for tightness before vaping. NOTE: Moving the ring to the left will reduce airflow, giving you a tighter hit. Moving the ring to the right will increase airflow, giving you a bigger hit. TO CHANGE THE COIL: Turn the tank upside down and unscrew the base assembly cap from the bottom of the tank. Thread on a new coil ( do not over tighten the coil into the base, a snug fit is all you need) Reinstall the base assembly into the tank. NOTE: PG high E-Liquids vape better when the airflow is cut off or lessened; VG high E-Liquids vape better with more airflow. TO FILL/REFILL: Turn the tank upside down and unscrew the base assembly cap from the bottom of the tank. Fill with approximately 2.0ml-2.4ml of e-liquid by tilting the AeroTank at a slight angle and dripping juice down the inside wall against the outer wall of tank. Screw the top cap assembly back onto the tube. Screw onto the battery and you're ready to vape. Let the AeroTank sit for a few minutes when first filling with liquid, this will allow the liquid to absorb into the coil wicks. Firing the AeroTank with a dry coil can cause burning of the wicking material and possibly ruin the coil. NOTES: Initial charge should be for 8 hours, additional charges should be NO MORE than 4 hours at a time. ONLY USE THE CHARGER CORD PROVIDED WITH THE KIT.